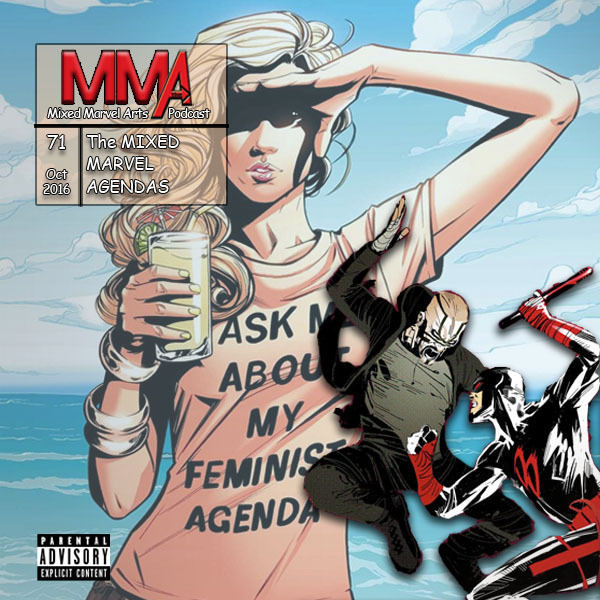 The Mixed Marvel Arts Podcast exploits topical agendas for this episode focusing on feminist issues and the Fantasy Comic League. Lannette, the Mixed Marvel Arts SnapChat correspondent, lingers past the opening introductions to introduce herself a bit more. Shaun details the recent kerfuffle brought about by Mockingbird’s final issue and pointedly remarks that comic book superheroes are the quintessential Social Justice Warriors. Brian hopes for a promising rebirth to the X-Men comics and announces the winner for the October Mixed Marvel Comics Giveaway, @VaderTheTrader. The duo finishes up the episode by hastily scrolling through the October Fantasy Comic League points, where @MattSchottroff comes out on top. Episode artwork: Mockingbird, volume 1 #8 by Joëlle Jones and Rachelle Rosenberg; Daredevil, volume 5 #12 by Ron Garney and Matt Milla.